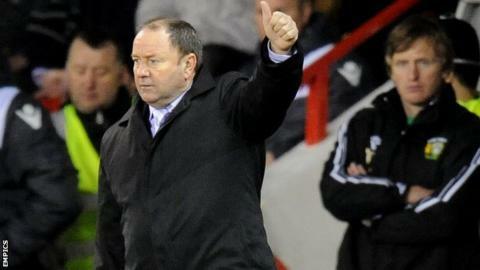 Yeovil boss Gary Johnson has said his stand-off with the club's board will not be a distraction for the players. Johnson arrived only 15 minutes before kick-off in Tuesday's Johnstone's Paint Trophy defeat by Portsmouth and left after his post-match team talk. The Glovers boss revealed he was angry at the club's board after he missed out on new signings on Monday. In a statement released on Friday, the club said communication problems were behind the perceived difficulties. The statement on the club website read: "Yeovil Town manager Gary Johnson has met up with chairman John Fry, who has just returned from holiday. "After a cordial discussion, the manager and chairman have agreed that communication problems were at the bottom of the perceived difficulties the manager experienced on Transfer Deadline Day last Monday." Fry said: "It was merely a question of the right people not being able to talk to each other. Gary and I have discussed things this morning and it is business as usual at Huish Park. "Gary has left with the team for Bradford fully focused on the job in hand, determined to get three points at Valley Parade." Earlier, Johnson had told BBC Somerset: "It's not going to affect the lads. "It's something I've got to sort out very quickly for my own peace of mind. "The chairman comes back (from holiday) tomorrow and I'll be speaking to him straight away." The 58-year-old explained that he tried to bring in three players - two from a Premier League club - before Monday's transfer deadline, but a "communication error" with the board meant the deals did not happen. When he arrived at Huish Park on Tuesday, he spent much of the time seated in the dugout, with assistants Terry Skiverton and Darren Way directing the team. But Johnson insisted there was no issue with his actions during the game. "I know people thought I was sat down not getting involved, but at that point we were 0-0," he said. "When I stood up and got involved we were 3-1 down. It was probably better that I sat down. "I hope people aren't thinking I've lost my mojo, my appetite or my passion because you can interview any of the lads about the game against Portsmouth, and they'll tell you I've not lost any of that. "I was angry, there's no disputing that, but it didn't stop me having a word with the lads about what they should or shouldn't have done." Yeovil go into Saturday's League One game at Valley Parade having taken only five points from their first five fixtures.